NEW YORK (CNNMoney.com) -- In the next few years, we'll be seeing more Italian cars on American roads as Fiat and Alfa Romeo return to the states after a nearly two decade absence. Fiat and Chrysler chief executive Sergio Marchionne says we'll also be seeing more Italian vehicles sold under the familiar American brands of Chrysler, Dodge and Jeep. If all goes according to plan, the changes should mean a better selection of smaller, fuel efficient cars at Chrysler Group dealerships. Chrysler Group executives have already announced that the tiny Fiat 500 will come to the U.S. late this year, sold at select Chrysler dealerships in major metropolitan areas. Ultimately, it will be available in four different forms: a hard-top, a convertible, an plug-in electric version and the high-performance 500 Abarth. Besides the 500, the only other product carrying the Fiat name in the U.S. will be a small crossover vehicle, a Fiat spokesman said. Chrysler dealers will also be selling three new Dodge branded Fiat-produced vehicles -- a small car, a new compact sedan and a new 7-seat crossover SUV -- in 2012. Fiat's premium Alfa-Romeo brand will return to the states in 2012, too, with the Giulia sedan and wagon. A year later, the Alfa Romeo MiTo small car will hit the market here, followed by the compact Giulietta in 2014. Two of Fiat Group's other brands, Ferrari and Maserati, are already sold here in the U.S., at least to those with the means to afford them. But Maserati will be getting a little more affordable with the introduction of a high-end mid-sized car that will cost about $75,000. The cheapest Maserati available in the states today costs about $120,000. The one Fiat group brand that won't come to the U.S. is Lancia. 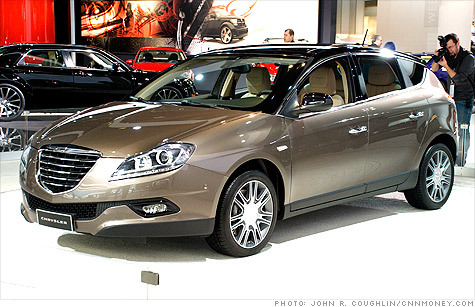 Instead, Chrysler Group and Fiat will merge the Chrysler and Lancia brands. Cars that are sold with Chrysler badges in the U.S. and Great Britain will be sold as Lancias elsewhere. While Dodge will sell some Fiat-based models in the U.S., outside of North America the Dodge name will appear only on performance-oriented products with distinctly American designs. Those will include the Dodge Challenger muscle car and a future version of the Dodge Viper supercar. The iconic Jeep brand will become Chrysler Group's one truly global brand selling under that name everywhere. Jeep customers in the U.S. will get to choose from some Fiat-based products, however, among the brand's smaller SUVs. While this means more cars being imported into U.S. Chrysler dealerships, it should also mean more cars being exported, too. In Europe, the Fiat Group, including Jeep, plans to introduce 34 new models over the next five years, of which 13 will be produced in North America.